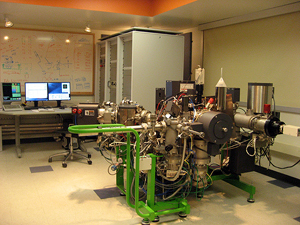 The newly established Microanalysis Center for Geochemistry and Cosmochemistry at Caltech houses two Secondary Ion Mass Spectrometry (SIMS) instruments, also known as ion microprobes. The Cameca NanoSIMS 50L is a type of ion microprobe designed for elemental and isotopic analysis of ultra-fine features (with spatial resolutions down to ~50 nm). It also offers extremely high sensitivity at high mass resolution and the capability of simultaneously measuring up to seven masses from the same small volume. The Cameca IMS 7f-GEO is a magnetic sector SIMS instrument based on the Cameca IMS 7f, but modified for geoscience applications. The combination of these two state-of-the-art ion microprobes in one laboratory provide powerful diverse capabilities in trace and isotope analysis, depth profiling, ion imaging and geochronology, with low detection limits, high spatial resolution, and/or high precisions. Link to Caltech GPS Division Analytical Facility. The Microanalysis Center for Geochemistry and Cosmochemistry at Caltech took the delivery of a CAMECA NanoSIMS 50L in last December and finished the installment and on-site tests in this past April. Now the instrument is fully operational and running well. The CAMECA NanoSIMS 50L is a new ion microprobe, developed for trace element and isotopic analysis of ultra-fine features. Among the unique new features offered by the NanoSIMS 50L are: 1) The ability to extend the SIMS analysis to extremely small areas or volumes (~35 nm size in cesium, ~150 nm in oxygen) while maintaining extremely high sensitivity at high mass resolution (HMR). This derives from the revolutionary coaxial optical design of the ion gun and secondary ion extraction, and from a new design of the magnetic sector mass analyzer. 2) The capability of simultaneously measuring up to 7 masses (ions), ensuring more efficient and precise isotopic ratios from the same small volume, or better ion image superimposition in imaging mode. Along with the 7 electron multiplier (EM) detectors, 4 Faraday cups (FC) are also installed on the Caltech NanoSIMS 50L, enabling to achieve the precision and external reproducibility of isotope ratio measurements down to the low sub-permil level. ﻿The CAMECA IMS 7f-GEO is a magnetic sector type SIMS instrument based on the CAMECA IMS 7f with dedicated options for geoscience applications. It is equipped with double secondary Faraday cups for high precision stable isotope analysis. The primary column on the IMS 7f-GEO consists of a duoplasmatron source, a microbeam Cs ionization source, a primary beam mass filter, fully automated slits and apertures, ion optics (lenses, stigmators and double deflectors) for primary beam focusing and rastering, and a high accuracy primary Faraday cup combined with a fast beam blanking system for monitoring the primary beam intensity during measurements. The sample chamber system can accommodate 1” round samples, has a UHV airlock with baking capability to store additional samples, a liquid nitrogen cold trap, an optical microscope and CCD camera system. The sample stage (X-Y) is computer controlled with position storage and recall capabilities; it also has a manual Z-axis for sample height adjustment, which is critical for obtaining reproducible results on different sample mounts. The normal incidence electron gun for charge compensation can operate from 0-10kV, has a maximum beam intensity ≥80µA. The secondary ion optics are continuously adjustable from -10 to + 10kV, with the imaged field continuously adjustable from 35 to 250 µm, and a dynamic transfer system which optimizes transmission for analyzed area up to 500 x 500µm. The Nier-Johnson type double focusing mass spectrometer has fully adjustable position and width on automated entrance and exit slits, automated contrast and field apertures, a spherical electrostatic analyzer for energy filtering, an automated continuously adjustable energy slit, a laminated electromagnet (120 mm radius) for fast peak switching. The detection system consists of an electron multiplier, double Faraday cups, and a micro-channel plate assembly. The NewView 6000 optical profiler is a powerful tool for characterizing and quantifying surface roughness, step heights, critical dimensions, and other topographical features with excellent precision and accuracy. All measurements are nondestructive, fast, and require no sample preparation. The NewView 6000 Series delivers < 0.1 nm height resolution. Caltech Microanalysis Center. ©All rights reserved. For questions and comments, please contact Webmaster.